For the last couple years I've had uncontrollable powdery mildew problems on my grapes. While I have used some control products, I didn't feel comfortable spraying chemicals anytime near harvest. 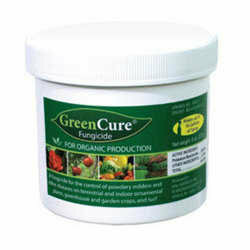 With GreenCure, I was able to spray preventatively and throughout the season and have had my best harvest in years. I am so happy to have a safe, organic way of keeping my grapes free of powdery mildew. I also found that GreenCure has worked very well in preventing apple scab. Thanks for such a great product.